"The Developing Nature of Arbitration in Mainland China and Its Correlation with the Market:Institutional, Ad Hoc, and Foreign Institutions Seatedin Mainland China"
Abstract: In the process of developing arbitration in Mainland China, there are three important landmarks dividing the development into three phases. The Arbitration Law in Mainland China was promulgated in 1994 taking effect in 1995. As such, the first phase has been chronicled as between 1995 and 2006. This initial stage is characterized by the unitary system of institutional arbitration and the denial of ad hoc as well as foreign arbitration. In the second phase which is between 2006 and 2015, the position has been pushed forward by some recent reforms. In particular, the operation of foreign arbitral institutions seated in Mainland China has been relaxed in two recent cases, i.e., the Duferco case in 2009 and the Longlide case in 2013. Moreover the institutional arbitration market in Mainland China has been developed during this period as driven by not only the dramatic CIETAC split episode in 2013 but also the intensified competitions among local arbitration commissions in the past several years. The third phase is triggered by the issuance of the SPC Opinions on Providing Judicial Safeguard to the Construction of Free Trade Zones in 2016. The 2016 SPC Opinion is interpreted as limitedly granting validity of ad hoc arbitration and further promoting foreign institutional arbitration in Mainland China, both of which represent the latest development trend in the landscape of Mainland Chinese arbitration. 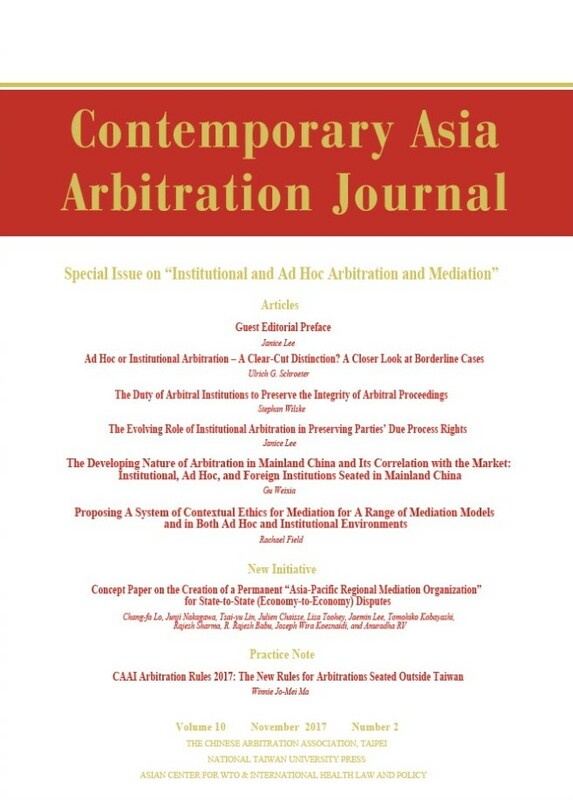 Focusing on the development of institutional, ad hoc and foreign institutional arbitration in Mainland China, this Article takes a law and development perspective in analyzing the nature of Mainland Chinese arbitration, probes into the distinctions of development path and predicts into the future of development trajectory.